A few weeks ago I posted my latest discoveries in growing sweet potatoes this summer, along with a few changes that were made in my organic cultivation practices. Kenny, let me tell you about my sweet potato experiment, to give folks another set of trials to evaluate. I also purchased slips from Mericlone Labs. Due to a shipping glitch and bad weather, I had to hold them in containers before setting them out in the garden. Because of the size of the slips, I opted to fill plastic newspaper bags with potting soil to accommodate them. Because of my Small Space Garden, when I say I need four slips, I don’t mean three slips each of four different varieties! So I had many extras to give away. Some of the sweets I ordered were the same as yours: Speckled Purple, Purple, 8633, and Korean Purple. Mericlone also threw in some Covingtons for free. Since last year I harvested five pounds of sweet potatoes from one pot, I decided to try that method again with the Mericlone slips. I have one plant of each variety in five large pots containing a good mix of compost, kelp, cottonseed meal and potting soil. These went in early, and the pots were placed under a heavy clear plastic cover that I got from a mattress sales office. Recycled wire supports from political campaign signs were used to lift the plastic. The container grown sweet potatoes stayed under this plastic until the weather had warmed consistently. Because they are in pots, the sweet potato vines need special attention to monitor soil moisture and also must be watered every day. The vigorous vines are crawling out of bounds and rooting wherever they make contact with the ground. What the results of their spreading and rooting will be I do not know. Later I will top-dress with compost and mulch them with bedding. I also have four varieties in the ground, in a square about 4′ on a side: one each of 8633, Covington, Korean Purple and Purple. These plants have a sprinkler hose underneath a thick mulch of used rabbit bedding. They have spread throughout their area and are sneaking under the tomatoes and onto the driveway. So between the two of us, we have several different growing techniques in action; your black plastic mulched and fabric covered group, my group of sweet potatoes growing in pots, and another group planted under a straw/hay mulch. None of my sweet potato vines have produced blossoms at this point, which seems to indicate to me that at this point, your method is superior to either of mine. When harvest season comes around, we can compare our yields and let readers know the results. Peace in the Garden, Barb. Thanks for the report Barb! I’m not sure how much significance to place in the fact that my sweet potato vines actually produced flowers earlier this summer. The plants continue to look very healthy and grow well. I also have one sweet potato vine growing in a container; it’s sharing space in an EarthBox alongside a cucumber and a Green Zebra tomato. The real test will come after the roots are dug up at harvest time. That won’t be for a while yet, I usually allow the sweet potato vines to remain in the garden and continue growing right up till a light frost strikes. But I’ll be sure to share the results with everyone as soon as the harvest is in! This is the finest looking homegrown potatoes I have ever seen. I can just imagine how tasty they are. Can you tell me what variety of potato is in the picture? As in the pic above with the potato in the cup, does it matter if the pointy end is up? I’m new at this and wanted to give it a try this season. I planted my sweet potato plant in a container and placed on my patio. It’s growing really well the leaves are green and healthy looking. I water every day morning and late evening because it gets really hot on the patio. I need to know how can I tell are see the sweet potatoes it’s been over 95 days. 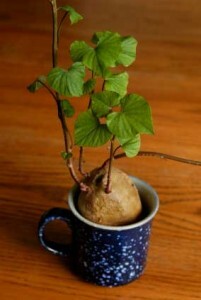 Hi Helen, I would just let the vines grow and trust that the sweet potatoes are growing underneath. I harvest the tubers as fall approaches but before a hard frost strikes the plant. I would love to know your outcomes, and anxiously await the results of my 1st efforts (in Vt.!!!) as well. I have three in big pots on the deck and plan to wheel them into the glassed in porch soon to extend growing season. Two more of a different variety are in my garden, and one of the dark purple is in the ground below the deck. Hi Sally, I have a couple reports from last season by Barb and another reader that I will try to post this week and also add some of my own thoughts on last summer’s harvest. I didn’t plant sweet potatoes this year but did have some sweets that were harvested in the fall of 2010 and kept just fine over the winter and well into this year. I love your site and your experiments with the sweet potatoes. I myself am experimenting with container grown SP. I am in Dallas so we are just now getting cold, but not yet freezing. I am trying to debate as to go ahead and harvest my pots (5) as our low is going to be around 40 degrees but can get colder or wait until I know a freeze is coming. I am anxious and excited all at the same time to see what, if anything, I wind up with. We had such a crazy summer and growing season here. I just pulled up my melon patch today. I still have green tomatoes on the vine as well as 2 cucumbers still growing. My newly planted lettuce, beets, and mustard greens are thriving in the dropping temps. I am anxious to see how your potatoes come out! Please include me on your email list. 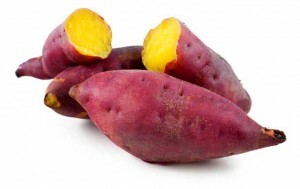 I have been trying to find Okinawian Sweet Potato Slips. This is the third year I’ve tried. I ordered some at a restruant in Ca. and really liked them. Does anyone know where I can order some? No substitutes please. Probably the only place to get them is from Sandhill Preservation. Place your order no later than December 1, if you want to get them in 2013 and then say prayers. Beware Okinawian SP take a VERY long time to mature…upwards of 140 days of very hot weather. Good luck. I planted three sweet potatoes in a container in my back yard,and they were growing real good and the vines were real green and pretty. Then one day I looked out and there was a squirrel sitting on the side eating all of the leaves. My question is can the potato develop without the vine and leaves? Ethelyn, they may hopefully sprout more leaves and vines but the plants do need leafy vegetation in order for the potatoes to develop. I’ve never had a squirrel eat the leaves like that. Baker Creek Heirloom Seeds carries the Okinawan Sweet Potato slips. I just received my order of three slips and they will be planted in my giant home made earth boxes. If you still can’t find any plants by this fall’s harvest, contact me through this blog and I’ll share with you.